I am the co-founder and C EO of Kuaiwear, and I am an experienced marathoner, triathlete, Ironman, master diver, and rescue diver. I earned an international business and international marketing degree from the University of Gloucestershire and have worked extensively to develop new, exciting products. I’m a passionate athlete, and the desire to exercise more efficiently drove my team and me to create Kuai. 2. You have a new product set to release. What is the benefit of this product and what is the difference between this and other smartwatches? Kuai is the first product of its type, and there are several features that set it apart from other smartwatches. It uses clinically validated technology that accurately measures users’ data and even provides voice feedback and coaching while swimming, something other watches aren’t able to do. Users may also answer phone calls and listen to music without having to carry multiple devices during a workout. 3. Many coaches want to know the cost and how it will help their team, how do you answer this? Kuai is a great tool for coaches because they will be able to use training plans developed by professional athletes of different sports or create custom training plans and upload them for users to download. During a workout, users will receive voice feedback and configurable voice alerts to keep them on track. We’re still working on the cost but will make an announcement once we have a set figure. 4. What else do you want to add to this product in the future? We certainly have plans for extra features and will announce those as well in the future. In the meantime, our Kickstarter page lists six stretch goals that, if reached, will allow us to add: memory foam tips, new color option, FM radio, gear alerts, extended warranty and a charging case. 5. How do you know this product is accurate? We have been working nonstop to create a product that offers athletes accurate data, and have achieved that with Kuai. Our headphones use Valencell’s PerformTek® sensor technology, which is clinically validated by Duke University’s Center for Living. During the development stage of Kuai, we conducted extensive lab testing after each design modification on groups of more than 20 individuals of different sizes, races, and gender. These tests analyzed fitting and biometric performance tests using Polar products and other lab equipment as benchmarks. We meticulously developed and tested prototypes until we achieved the perfect fit and the most accurate data reading from the sensors. Once we move into the production phase, 100 percent of the sensors used inside Kuai will be checked using our custom testing unit, and 100 percent of finished units will be tested for connectivity. Also, 10 percent of completed units will be tested in a certified water tank for a 3m deep simulation. 6. Say a coach has a group of 30 elite swimmers. How can they use this product? The coach could upload his or her training plans, which can be downloaded by the swimmers. The coach is then able to follow all the data recorded in the swimmers’ devices (heart rate, speed, distance, laps, pace, VO2 max, calories). Performance data is stored in the cloud to sync across all Kuai platforms and saved in the .fit format to sync with other fitness apps. 7. How can a triathlete, training by themselves use this product? Triathletes need to train with as little equipment on them as possible, so as not to be slowed down with extra weight. Kuai is a great way to fix that issue since it combines a heart rate monitor, foot pod, sports watch, MP3 player and virtual coach into one device. It’s also a great self-training tool because users have the options of downloading professional training plans or creating their own interval routines. During their workout, they will hear voice feedback and configurable voice alerts, which help them stay on track while listening to music. 8. What other swimming technology do you feel swimmers should be using? At the moment, there’s not a lot of great tech gear available for swimmers. In my own training for triathlons, I haven’t found a device that I can truly rely on, which is why I set out to create a comfortable and accurate headset that can change the way we train while swimming. 9. What do you envision for the future of swimming technology for training? I envision a wearable coach that is lightweight, comfortable and accurate. 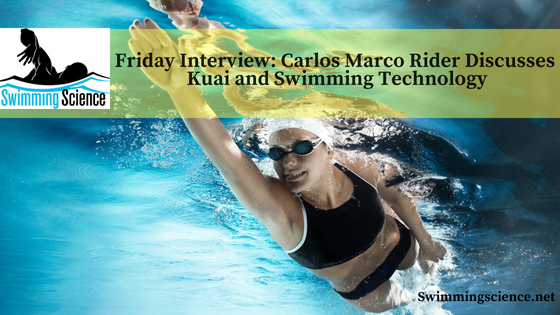 We have done extensive testing on our technology and will continue to do so in order to stay ahead of the game in terms of wearable swimming technology and offer a valuable product they can trust. At the moment I’m focusing my time and energy on Kuai. It’s a revolutionary product that will help users train smarter and more efficiently, and it’s a project that I am very passionate about. You can expect to see us introduce new features to Kuai in the future, and constantly work to make it the top training tool among athletes of all levels.